Badgers running back Corey Clement rushes for a touchdown during the first quarter against the Rutgers Scarlet Knights at Camp Randall Stadium on Saturday. MADISON — Dressed neatly in a suit postgame after a productive return to the field, Corey Clement flashed a wide smile after sitting down in front of cameras. "It felt great to be back out there," Clement said. "I couldn’t ask for anything else from this game." He hadn’t played since the season opener against Alabama, then tried to practice for a couple weeks through what he thought was a less serious groin injury. He then divulged more details to team medical staff. "It was a bigger boost seeing him make some runs than just seeing him in the huddle," coach Paul Chryst said. Wisconsin’s defense hasn’t missed a beat while Clement was away. "We started off early running the ball but we kind of fell behind and weren’t able to pick it up," running back Paul James said. Save for one drive in the first quarter, the sure-handed linebackers and secondary contained the Scarlet Knights’ skill position players. "They present a lot of issues," Rutgers coach Kyle Flood said. 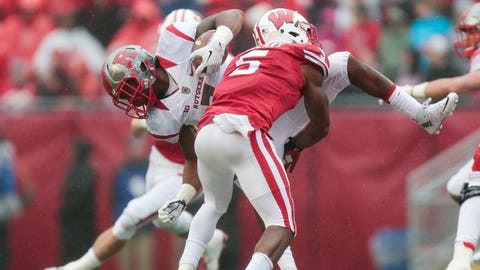 Rutgers’ only touchdown came when freshman Blessaun Austin intercepted a poor pass by Wisconsin’s Joel Stave and returned it 50 yards for a score in the third quarter. The Badgers’ drives on average started at their own 47, while Rutgers on average started at its 25. The Scarlet Knights were held to eight three-and-outs. If it wasn’t for the injury, Clement would probably have scored his fourth touchdown of the day on that play. Instead, safety Anthony Cioffi tracked down Clement from behind. "No, that’s not running out of gas," Clement said. "It was just getting through the soreness." Their hopes to get three more wins to reach bowl eligibility took a hit, and the outlook isn’t so good either next week with a trip to Michigan.